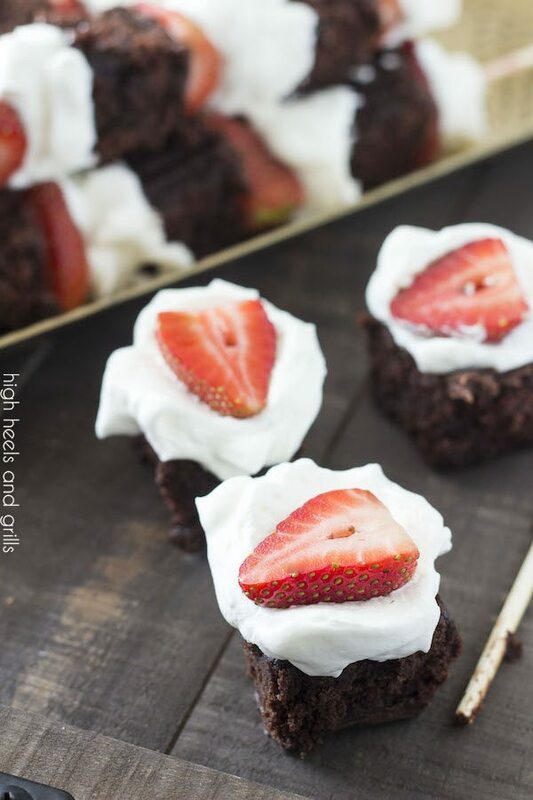 Swap pound cake for brownies and you have these yummy Strawberry Brownie Shortcake Kabobs. They are so easy to put together and they make for the cutest little party food! It’s the second half of January, which means February is right around the corner. And we all know what that means – Valentine’s Day! Some know it as the day of love, others know it as the day we eat the best candies they can sell in stores. Namely, chocolate. 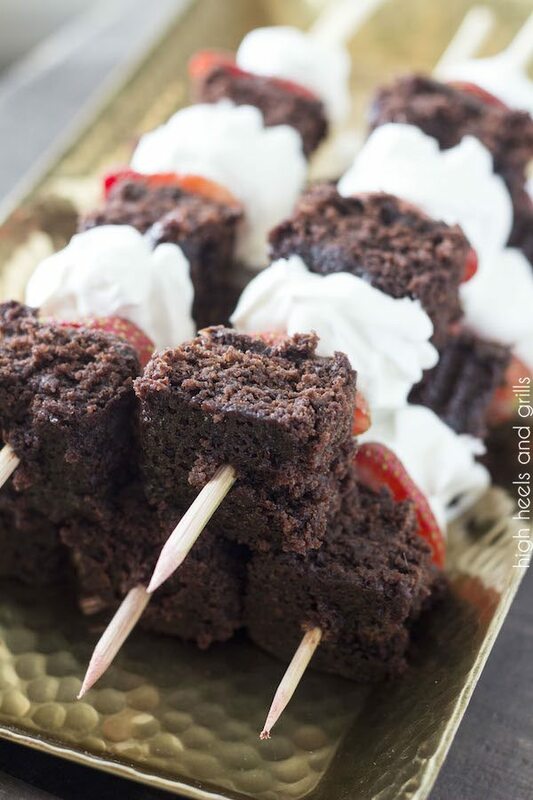 Which is why these Strawberry Brownie Shortcake Kabobs are perfect for the occasion. Or any occasion for that matter, because with how easy they are to make, you’re going to want them all the time. 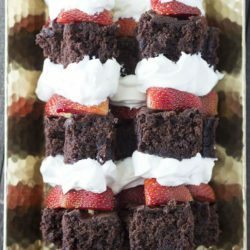 First, you layer on a fudgy brownie. I prefer mine to be pre-made, just because it’s easier and they tend to hold together better for skewing when they are store bought. Use ones with or without icing, it really doesn’t matter. Next, you add a half of a strawberry to give yourself the illusion of being healthy, even though they totally aren’t. Finally, you wrap a little bit of homemade whipped cream around the skewer, letting it grip onto the strawberry. You might be tempted to use frozen whipped topping, it is thinner and likes to slide off. Plus, it tastes a lot less delicious. I promise that the homemade whipped cream is super easy to make and is totally worth the little extra time it takes to make it. And in case you were worried about any possible mess in the eating process, these babies slide off the skewers like a dream, into a perfect, collected little bite. In a medium bowl, combine the whipping cream and the sugar. Beat with a hand mixer with the whisk attachment until very stiff peaks form. 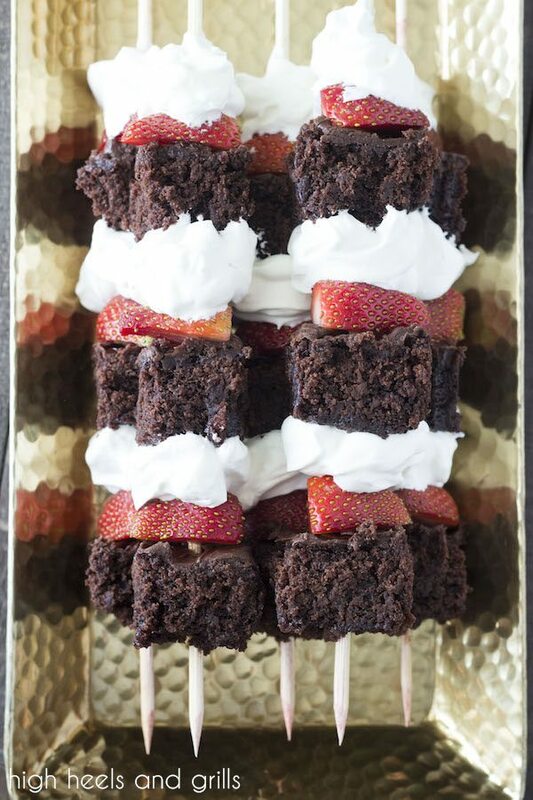 Slide a brownie and strawberry onto the skewer. Using a knife or spatula, scoop up some whipped cream and gently wrap it around the skewer, letting it catch on the strawberry. Repeat steps 2 and 3, three more times until finished with all of the ingredients.